Time was when a U.S. custom cabinet shop had to look beyond the U.S. borders and coastlines for an automated straight-line edgebander to edge finish particleboard, MDF and hardwood plywood components. That was before 2008, when Safety Speed Manufacturing of Ham Lake, MN, purchased the engineering designs of a pair of edgebanders from Anderson Manufacturing Technologies (AMT) of Alberta, Canada. While sales for the initial launch of Safety Speed’s edgebander program were hamstrung by the Great Recession, the timing was not without a silver lining. For many of the fewer buyers in need of an edgebander during those dark economic times, the low-cost, high-value proposition of Safety Speed’s hot air and glue pot machines proved appealing. Safety Speed was able to snap up market share at the expense of its much higher-cost competitors. Even today, both models are priced under $10,000. 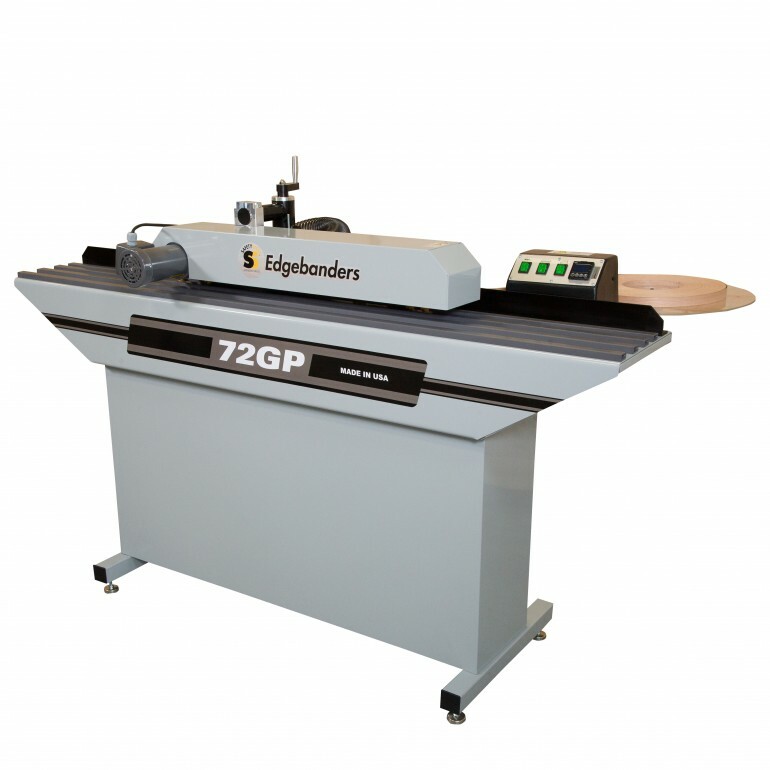 The 72GP Glue Pot Edgebander offers great flexibility for small- to medium-sized woodworking companies. It can apply polyester, PVC, wood or single laminate strips up to 1mm thick on edges up to 3-1/2 inches wide and parts as short as 6 inches. The glue pot is manufactured with ease of cleanup in mind and a standby temperature mode to prevent overheating of the glue. (Learn more and view video). The 60HA Hot Air Edgebander, 60 inches long vs. the 72GP’s 72-inch length, has many of the same features of the 72GP, including precise electromagnetic end cutters, an accutrim edge trim system and dust collection outlet to keep end trim off the part and the shop floor. The 60HA uses pre-glued edgebanding that is applied with heat supplied by an electric blower system. The machine also features electronic variable speed feed and digital electronic temperature control. (Learn more and view video). Donahue’s belief that a made-in-America edgebander could successfully compete in a market dominated by many well-established Old World manufacturers has paid off. It is one thing for dealers to like the products and their attractive price points, especially that of the 72GP, but what about craftsmen? Making a Choice: Glue Pot or Hot Air? Considering the 72GP edgebander is priced less than $3,000 more than the 60HA, it’s easy to see why it is the more popular choice between the two machines. This goes not only for U.S. customers, but also for those in Canada, Mexico and even South America.